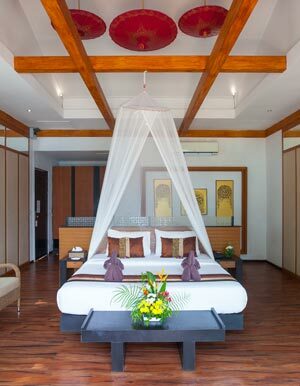 If you prefer extra space and pampering choose our 40sqm Villa with Plunge Pool. 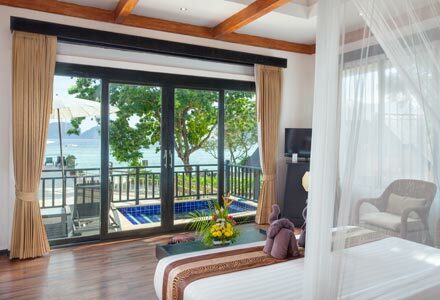 These Phi Phi Island Villas are positioned at the front of the resort closest to the beach, some with a lovely sea view. It is so easy to spend time relaxing on the large balcony with sunbeds, a parasol and a refreshing Jacuzzi plunge pool. Inside the high ceiling, quality furnishings and floor-to- ceiling windows create a bright and relaxing ambiance. There are chilled drinks in the refrigerator, a kettle to make a hot coffee and a good range of international channels on television.